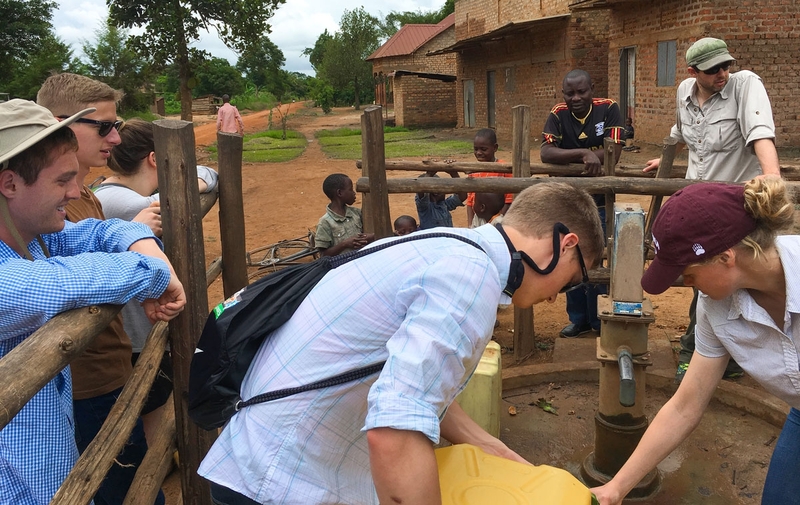 Carroll students inspect a water supply well in Kawango Village, Uganda. Engineering is a dynamic field at the cutting edge of bringing science and mathematics to solve real-world problems. Worldwide, engineers work to improve lives by solving technical problems in structures, transportation, environmental protection, water resources, energy, mechanics and machinery, medicine, public health, electricity and electronics, computers and communications, and chemical processes. Among the many benefits of pursuing a career in engineering is the broad spectrum of specialties from which you can choose. Carroll offers a flexible Bachelor of Science degree program in Civil Engineering that allow you to customize and design a career path that aligns with your interests and goals. In both programs you’ll find expert faculty, modern computer and communictations infrastructure, fully-equipped engineering labs and classrooms, and an emphasis on service. The Civil Engineering program at Carroll is are accredited by the Engineering Accreditation Commission of ABET (www.abet.org). You can also consider the Dual Degree (3-2) Program that Carroll offers in affiliation with other engineering colleges and universities. Find employment in their chosen fields and enjoy successful and rewarding professional careers. Seek and engage in lifelong learning to grow and develop in their chosen professions. Demonstrate leadership, especially through good teamwork and effective communication skills. Conduct themselves as ethical and responsible professionals, always mindful of the safety, environmental, economic, public health, and aesthetic impacts of their work. The four major areas of study with the Civil Engineering major are: structures, environmental, water resources, and transportation. Students may choose one of two emphases: broadfield civil or environmental. Why Should You Study Engineering at Carroll? At Carroll, we refer to our program as "Engineering Plus." When you study in Carroll's Catholic liberal arts environment, you learn to develop and express informed opinions, communicate complex ideas and concepts effectively, understand better people and their environments, and appreciate the richness of diversity. Developing these skills give Carroll engineering graduates a key advantage in their professional carreers. Why else should you choose to study engineering at Carroll? Graduates consistently earn competitive jobs and are accepted to top graduate schools. Consistently ranked the #1 Regional College in the West by U.S. News & World Report, Carroll offers a solid technical engineering education framed in a strong liberal arts environment. Our faculty are seasoned engineers who present engineering challenges in a way that reflects the impact they have, not just in a classroom or lab, but also in the real world. You’ll learn in small, engaging classroom settings in which your professor will know your strengths, interests, and goals, and where you’ll work closely with your fellow students. You can join our chapter of Engineers Without Borders and work on engineering service projects in Guatemala, Mexico, Saint Lucia, and Uganda, as early as your freshman year. You can join our chapter of the American Society of Civil Engineers and participate in the annual concrete canoe and steel bridge design competitions, mentor local high school students in engineering activities, and meet with engineering professionals and Carroll alumni about strategies and opportunities for a challenging and rewarding professional engineering career. As an engineering graduate from Carroll you’ll be in a position to earn an excellent salary in a high-demand profession, help solve problems facing people and communities around the world, and to pursue an advanced degree in engineering or other discipline. Our recent graduates have entered the workforce, joined the Peace Corps, been accepted to top graduate programs, started their own businesses, moved into management and executive positions, and enjoyed fulfilling careers in private engineering consulting firms, manufacturing, construction, and government agencies. The Carroll Chapter of Engineers Without Borders USA has active projects in four countries, where students will travel before the onset of each Spring Semester. Our faculty are practicing engineers engaged in consulting, service projects, teaching and mentoring. The engineering lab on campus is fully-equipped and even includes a gas grill for the occasional barbecue.